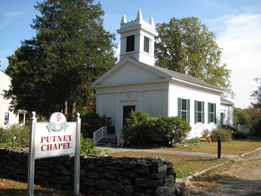 The Putney Chapel is made available for weddings, baptisms, and funerals by the Putney Chapel Association, a volunteer organization. The chapel is located at 5936 Main Street, Stratford, Connecticut. The chapel is handicapped accessible. The chapel is equipped with air conditioning. There is sufficient parking on the lawn next to the chapel. Our season runs from May 1st until October 31st. The chapel can be rented "as is." The total fee for use of the chapel is $350. The number of guests is limited by the fire marshal to 65. We require that you empty the chapel of any decorations you bring in immediately after your event. As the chapel is a historic building, there is no smoking, no lit candles, and tacks or tape cannot be used on the walls. We ask that guests do not throw rice, confetti, or bird seed outside. Contact us at PutneyChapel@gmail.com for further information.